I recently spent five nights in Chicago and loved it! It's such a cool city with lots of great food (priorities). I LOVE exploring a new city and seeing all that it has to offer. That of course includes the local cuisine, which in this case was deep dish pizza. I definitely wouldn't replace regular pizza with it if I had to pick one but I won't discriminate against any kind of pizza. Sauce + Cheese + Dough...I'm in. Chicago is a really great food city and I loved every meal that I had. The only downside of Chicago was that it was even colder than New York. I definitely need to go visit again when the temperatures are higher and I can go on a boat on the water and enjoy all that Chicago has to offer in the summertime. The wind was no joke either! Fun fact: the reason that it is called the Windy City is not because of the gusty wind and it is instead thought to originate from the hot aired politicians. There are a lot of great options for places to stay in Chicago. I can help match you with the best hotel for YOU, your plans/desires, and your taste. I get added amenities for my clients at no extra cost at all of the luxe properties so definitely reach out to me via email at carly.robinson@smartflyer.com or fill out the contact form on my website. Pequods is supposed to be the best one. We were supposed to go to the location in Lincoln Park but ended up canceling the reservation after a bunch of my friends' flights were delayed. I thought that it was impressive that they let us make a reservation for a large group there. Lou Malnatis seems to run a close second for deep dish. I thought that it was great! However, Jay and I made the mistake of each ordering a personal size (small) and as a result, it was not as thick. It didn't give the true deep dish impression and in hindsight, we should have ordered a medium size and split the toppings on each half of the pie. This would be a fun place to go watch a game on TV too. Pro tip: if you have to wait for a table, place your pizza order in advance. It takes 45 minutes for them to make it so you will get to sit down and eat (you'd have to wait either way). Giordanos (pictured above, along with my puffy "I've been eating too much salt" face) is the most recognizable name in the deep dish local chain. We got a large pie here since we went with friends and it did NOT disappoint! Yum! Girl and The Goat: So freaking delicious and full of unique dishes. It was one of the best meals I've had in a long time. It has a lot of small plates, so you get to try a bunch of different things. We loved EVERYTHING! It's located in the West Loop, which has tons of great bars and restaurants so its easy to grab a drink before or after somewhere. I also heard great things about their sister restaurant, which is a much more casual spot called Little Goat Diner. RPM Italian: We LOVED our meal here! They had classic American-Italian dishes with an upscale flare. The restaurant had a chic feel to it and was really big (especially compared to what we are used to in NYC). This was a perfect date night spot. RPM Steak: The sister restaurant to RPM Italian (both are owned by Guiliana Rancic and her husband). I definitely trust it after my experience at RPM Italian. Alinea: A major fine dining experience. It features a tasty menu and is pricey but supposedly worth it. Make sure to snag a reservation well in advance. Monteverde: Another upscale Italian spot that I heard incredible things about. Topolobampa: Rick Bayless's Mexican restaurant with a Michelin star! The Allis at Soho House: This spot at the Soho House (pictured above) has decor that makes my heart sing! This area of Soho house is open to the public (without a membership) and is definitely worth checking out. Sit on a swanky velvet couch and sip on a cool drink in this cozy atmosphere. Chicago Athletic Association: Bars at an athletic association?! This athletic association/hotel is not like others and is a sight to see in Chicago. Cindy's is a fun rooftop bar locate there with great views! It also has a game room with bocce courts and table games that you can play while sipping on some beer or a cocktail. City Winery: It has igloos on the river that you can sit in and shield yourself from the cold! Stock Exchange at Ceres Cafe: A fun happy hour! The Signature Room: This spot may be somewhere that tourist frequent more than locals but the city views are the reason why! True Food Kitchen: Healthy food that's amazing in a really cool atmosphere. You feel like you are in California more so than Chicago. Au Cheval: Known to have one of the best burgers in the world (my friends attested that it's true). Bad Hunter: Great for a group brunch (like the one we were at in the photo above). You can tell that they use real ingredients when they cook. It had a lot of natural light coming in, which I'm a fan of. The Allis: Remember that cocktail lounge at Soho House that we went to and loved? Well, they serve meals too and I was hoping to go there for brunch but we couldn't get reservations. They also do an afternoon tea with snacks, which seems totally up my alley! 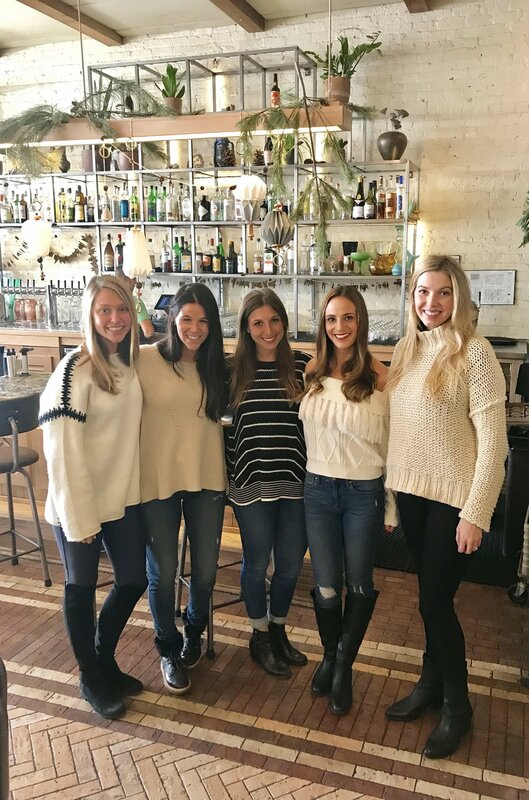 Summerhouse Santa Monica: Came highly recommended for brunch because it brings great atmosphere and food to the table (literally)! Ema: Multiple friends of mine recommended this Mediterranean spot. It's supposed to have great cocktails too! Portillos: An infamous hot dog spot in Chicago and a "must do/eat" while there. Husband tested and approved! Eleven City Diner: The bride's favorite breakfast spot in the city! Cafe Ba-Ba-Reeba: Authentic Spanish cuisine, served tapas style. Little Goat Diner: The sister restaurant to Girl and The Goat with a more casual flare. I hands down trust this place after my experience at Girl and The Goat! Eataly: Eataly in any city is a good idea! The welcome party for the wedding (pictured below) was held there and the food was on point (as always). Skydeck Chicago: We bought tickets for this online in advance. You definitely have to work your way through various lines to finally get into "the box" but I personally thought that it was worth it. There are murals and historical facts on the walls that you can read while waiting, which was nice. There are also big windows all around the top floor that allow you to take in different perspectives of the city. It's a cool experience to stand in a glass cube that juts out of a building and overlooks a city. Someone that works there directs you to keep moving along so you only get a minute or two in the box but the guide will take your picture for you during that time. We also asked the guide in the box next to ours to take our picture so that we could have it from a different perspective. I originally wanted to go at sunset because I think that it would be so pretty but we couldn't swing it. If you can go at sunset...do it! Cloud Gate: Aka the bean at Millennium Park. It was really impressive in real life and fun to see. It's also great to be able to see things in a city without spending money. Navy Pier: They are constantly hosting events, concerts, shows, art exhibitions...you name it! There are also a few rides on the pier. If you're going during the summer months, you can take a boat tour from Navy Pier. This is definitely a spot that is most enjoyable in the warmer months but they do host some indoor events in the cooler months. Magnificent Mile: This is where the shopping is at! It seems like this is the equivalent of 5th Avenue in NYC. There are more affordable stores in the surrounding area as well (along with a Sprinkles Cupcakes..we know where my priorities lie). Shedd Aquarium: I was looking for something to do indoors and I decided to check out the aquarium. 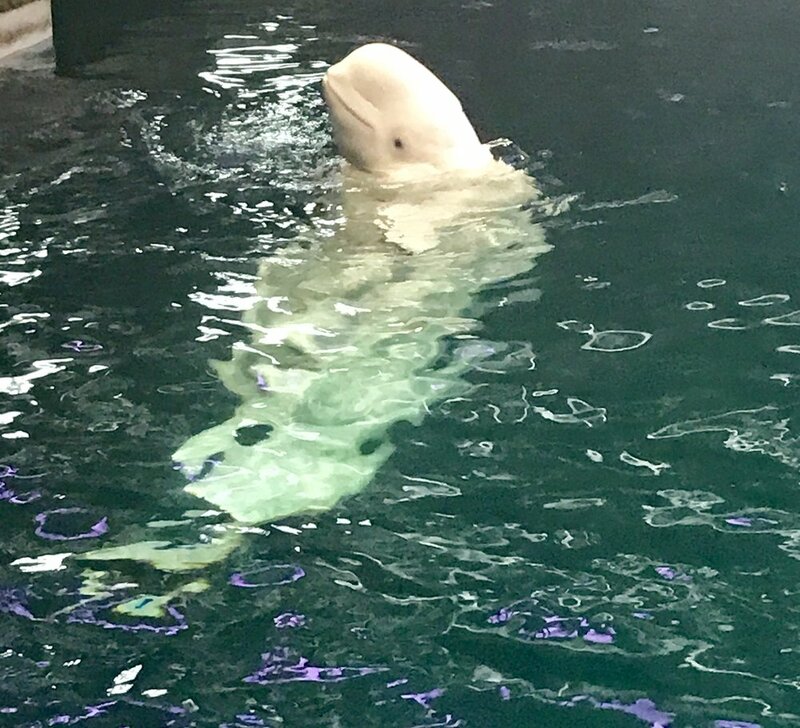 The Beluga whales were stunning and so playful so I'm glad that I got to see them. Be warned that it cost me $53 to gain admission but you can get tickets a little bit cheaper if you buy them in advance. Lincoln Park: Take in this beautiful park and the surrounding neighborhoods! You can also stop by Lincoln Park Zoo. Museum Of Science and Industry: This museum was really pretty from the outside but I didn't make it in. I think that it would be particularly cool with kids. AND THEN I WENT TO MY FRIEND'S WEDDING! My friend from Penn State got married at the Four Seasons and it was stunning! The flowers were out of this world and she looked incredible. It was SO fun to go to a NYE wedding (although I struggled physically to make it that late...yikes). I want one of my friends to get married on NYE every year because it was so awesome to get dressed up and party with my friends in celebration of something so special. If you're considering doing a New Year's wedding...do it! It was extra festive and fun and everyone came dressed to the 9s. I'm so glad that she chose Chicago for it because explore a new city with my best friends and husband!